A large, foliose species with conspicuous convex pustules across its surface and dark margins . Found on enriched rocks in upland regions. 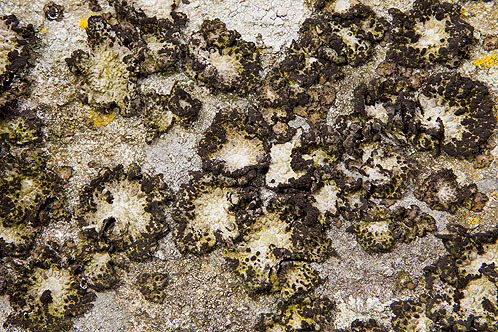 The common name is a direct translation of tripe-de-roche, the French name for the lichen. This lichen has been used for dyeing and also as a survival food in the Arctic to ward off starvation. The Lichens in this photo are about 2cm in Diameter. Found at numerous locations on the Preseli Mountains , including - Carn Bica , Carn Sian .